Thomas Paine (as his birth name, Thomas Pain; February 9, 1737 [O.S. January 29, 1736] – June 8, 1809) was an English-American political activist, philosopher, political theorist, and revolutionary. One of the Founding Fathers of the United States, he authored the two most influential pamphlets at the start of the American Revolution, and he inspired the rebels in 1776 to declare independence from Britain. His ideas reflected Enlightenment-era rhetoric of transnational human rights. He has been called "a corsetmaker by trade, a journalist by profession, and a propagandist by inclination." 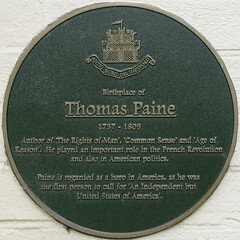 Born in Thetford, England, in the county of Norfolk, Paine migrated to the British American colonies in 1774 with the help of Benjamin Franklin, arriving just in time to participate in the American Revolution. Virtually every rebel read (or listened to a reading of) his powerful pamphlet Common Sense (1776), proportionally the all-time best-selling American title, which crystallized the rebellious demand for independence from Great Britain. His The American Crisis (1776–83) was a pro-revolutionary pamphlet series. Common Sense was so influential that John Adams said, "Without the pen of the author of Common Sense, the sword of Washington would have been raised in vain." 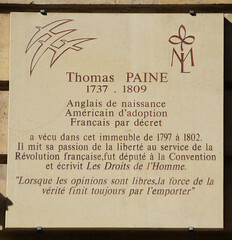 Paine lived in France for most of the 1790s, becoming deeply involved in the French Revolution. He wrote Rights of Man (1791), in part a defense of the French Revolution against its critics. His attacks on Anglo-Irish conservative writer Edmund Burke led to a trial and conviction in absentia in 1792 for the crime of seditious libel. In 1792, despite not being able to speak French, he was elected to the French National Convention. The Girondists regarded him as an ally. Consequently, the Montagnards, especially Robespierre, regarded him as an enemy. In December 1793, he was arrested and was taken to Luxembourg Prison in Paris. While in prison, he continued to work on The Age of Reason (1793–94). Future President James Monroe used his diplomatic connections to get Paine released in November 1794. He became notorious because of his pamphlets The Age of Reason, in which he advocated deism, promoted reason and free thought, and argued against institutionalized religion in general and Christian doctrine in particular. He also published the pamphlet Agrarian Justice (1797), discussing the origins of property, and introduced the concept of a guaranteed minimum income. In 1802, he returned to the U.S. where he died on June 8, 1809. Only six people attended his funeral as he had been ostracized for his ridicule of Christianity. Thomas Paine B.1737; D.1809. Author of "Common Sense", "Rights of Man", and "The Age of Reason", A founder of American independence with pen and sword. 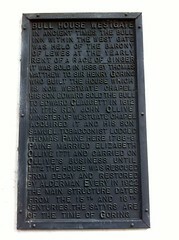 Lived in this house as exciseman and tobacconist. 1768-1774. Thomas Paine 1737-1809 here expounded his revolutionary politics. This inn is regarded as a cradle of American independence which he helped to found with pen and sword. "Common Sense". At his print shop here, Robert Bell published the first edition of Thomas Paine's revolutionary pamphlet in January 1776. Arguing for a republican form of government under a written constitution, it played a key role in rallying American support for independence. 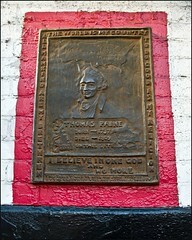 Thomas Paine 1737-1809 Journalist, patriot and champion of the rights of the common man. Thomas Paine son of an humble Thetford staymaker was born near this house. From his talented pen can the voice for the democratic aspirations of the American Republic through such splendid writing as Common Sense, Crisis an The age of Reason. Buried in New York this simple son of England lives on through the ideals and principles of the democratic world for which we fight today. In tribute to his memory and to the everlasting love for freedom embodied in his works the plaque is gratefully dedicated through the voluntary contributions of soldiers of an American Airforce Group. 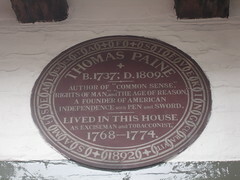 Thomas Paine, pamphleteer for American independence, bought this house in 1783, and lived in it periodically until his death in 1809. 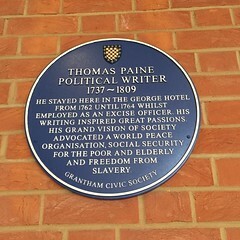 Thomas Paine political writer 1737-1809 He stayed here in the George Hotel from 1762 until 1764 whilst employed as an excise officer. His writing inspired great passions. His grand vision of society advocated a world peace organisation, social security for the poor and elderly and freedom from slavery. This sculpture was unveiled by Sir William Barlow, Chairman of BICC PLC on the 13th June 1991. It was commissioned by BICC Developments Ltd. and created by Kevin Jordan M.A. (R.C.A.I.) 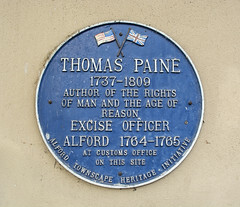 as a tribute to Thomas Paine, whose work 'Rights of Man' was written at the Angel and published in 1791.